An ECG checks your heart’s rate (how quickly your heart beats), rhythm (how regular the beats are) and electrical activity over a few minutes. The test involves lying down with small, sticky sensors called electrodes attached to your arms, legs and chest. These are connected by wires to an ECG machine. Before the electrodes are attached, you’ll usually need to remove your upper clothing, and sometimes your chest may need to be shaved. Once the electrodes are in place, you may be offered a hospital gown to cover yourself. The electrodes detect electrical signals produced by your heart each time it beats, and the machine records them as a graph for the doctor to see. It is quick, painless and safe, although there may be slight discomfort when the electrodes are removed from your skin (similar to removing a plaster) and some people may develop a mild rash where the electrodes are attached. 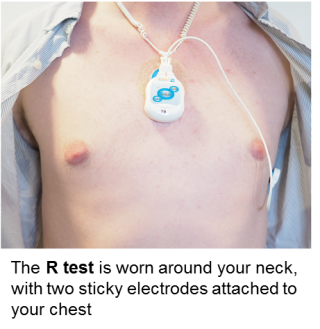 This is a small, lightweight monitor worn around your neck, which attaches to your chest using two disposable electrodes. It is different to the ECG described above, as it is worn for 5 consecutive days, during normal daily activities. It is used to continuously monitor your heart rate and rhythm, and automatically detects and stores the information. In a normal heart rhythm, each impulse from your heart’s natural pacemaker makes the sections of the heart contract regularly and in the correct order. Atrial fibrillation (AF) is the most common type of irregular heart rhythm, and happens when, in addition to the heart’s natural pacemaker, other areas of the heart make electrical impulses too. Instead of a co-ordinated beat, part of the heart twitches, which can allow blood clots to form; clots can travel through the bloodstream and cause a stroke. AF can make you feel faint, breathless or tired and may be felt as palpitations, but many people have no symptoms. If detected, treatment will be discussed by your doctor. Further information can be found from the British Heart Foundation (Tel: 0300 330 3311). An echocardiogram or ‘echo’ is an ultrasound scan of the heart muscle, chambers, valves and surrounding blood vessels performed by a cardiac physiologist or cardiologist. You will need to undress to the waist and lie on a bed. You may be offered a hospital gown to cover yourself during the test. Small sticky sensors called electrodes will be attached to your chest; these are connected to a machine that monitors your heart rhythm. A lubricating gel will be applied to your chest or directly onto the ultrasound probe. 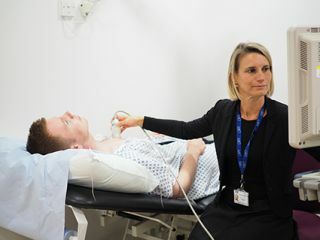 You’ll be asked to lie on your left side and the probe will be moved across your chest, assessing the pumping chambers of the heart and analysing how blood flows through them. The probe sends out high-frequency sound waves that create echoes when they bounce off different parts of the body. These echoes are picked up by the probe and turned into a moving image that’s displayed and recorded on a monitor while the scan is carried out. You won’t hear the sound waves produced by the probe, but you may hear a swishing noise as the sound of the blood flow through your heart is picked up by the probe. It usually takes about 45 minutes, and the results are available within a few days. It is painless and safe, although the gel may feel cold and you may experience some minor discomfort when the electrodes are removed from your skin.